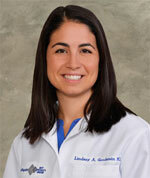 Home > About the Institute > Meet Our Doctors > Lindsay A. Goodstein, M.D. Treating both adults and children, Dr. Goodstein is trained in all of the latest advances in surgical techniques, including endoscopic sinus, microlaryngology, sleep, otologic, head and neck, and facial plastic surgeries. Her hospital affiliations include Abington Surgical Center, Blue Bell Surgical Center, Chestnut Hill, Einstein Medical Center Montgomery, Mercy Suburban and Roxborough Memorial Hospitals. Dr. Goodstein is a member of the American Academy of Otolaryngology-Head and Neck Surgery, the American Academy of Otolaryngic Allergy, and the Pennsylvania Academy of Otolaryngology.